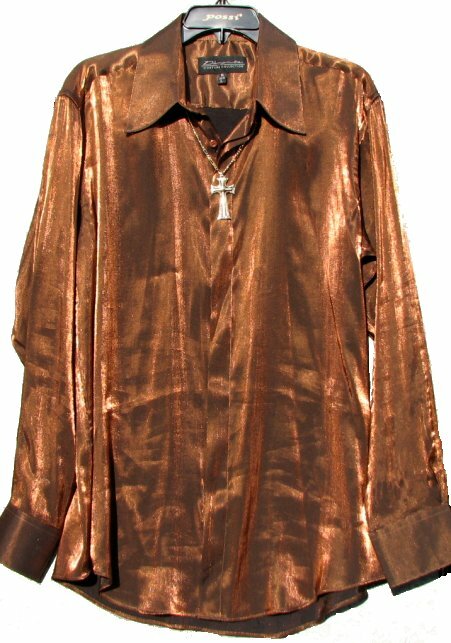 This shiny satin reproduction 70s style disco shirt is a bit darker than the photo. The copper shirt has a bit of black in the fabric so it would be a great match for black pants. The flashy shirt says it is a large, but it looks more like a today's medium to me. The chest will easily fit a 40" chest and the sleeve length is 33". After wearing it can be machine washed, but I would recommend hand washing or dry cleaning. The shiny fabric is probably rayon and it has been prewashed. Hand washing extends the life of the garment.